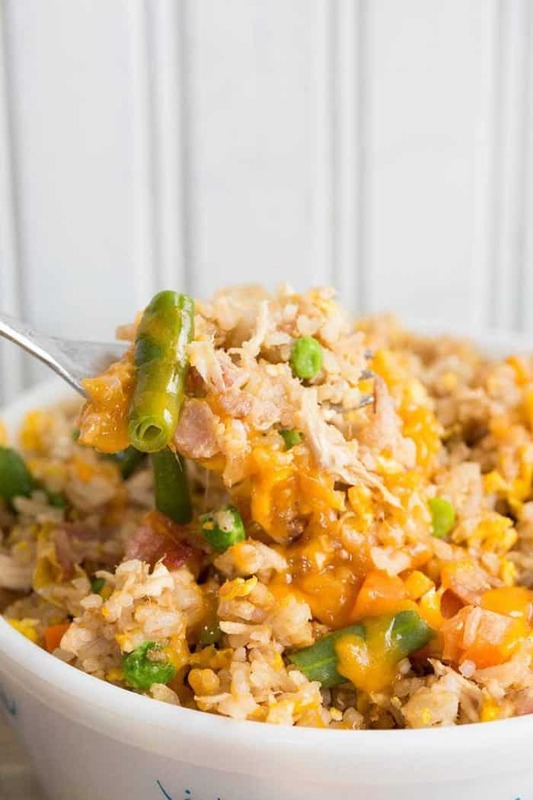 You guys, I feel that it’s my duty to share with you what I consider THE BEST FRIED RICE RECIPE EVER and share my top secret, most delicious ever, sanity saving, how to make easy fried rice recipe. Those of you who have hung around here the last few years know that I have this fear of labels. I don’t like labeling anything THE BEST EVER. I am telling you the truth when I can you can totally forget buying any take out fried rice forever and ever and ever from now on. This is it. 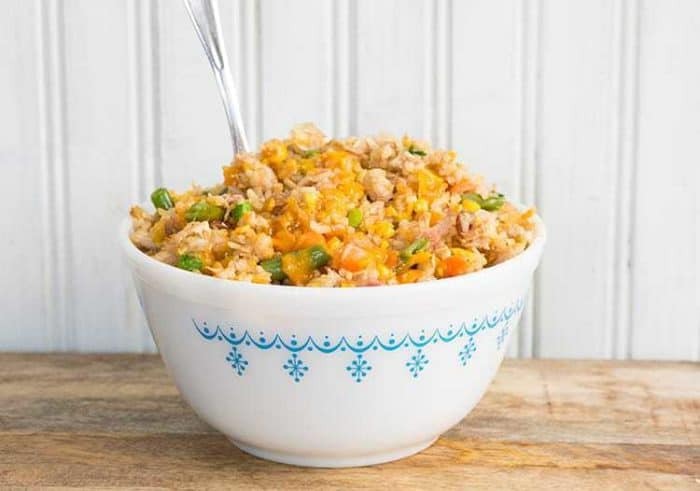 This easy fried rice recipe is your new lifesaver recipe that will keep you sane during the week. Mike and I have been eating fried rice this way since we were dating, in fact, it’s one of the first things we cooked together all the time. We were young and new cooks and used bacon droppings to make our fried rice. We have never turned back! In a large skillet, fry the bacon on medium-high heat until it reaches tender-crisp. Add in the garlic and fry for 1-2 minutes. Add in the sesame oil, soy sauce and oyster sauce. Stir in the meat and vegetables of your choice. Push the rice to the side or make a well. Add in the eggs and stir fry in that well until scrambled. Once done, mix the egg into the rice mixture. Fry the rice some more. Serve up in bowls and let the family top with green onions and cheese. What Meat Can I Use in Fried Rice? You can use almost any leftover meat that you have, from pork, to ham to chicken, it all will taste good in this. If you don’t have meat just add more eggs! You can also make my Shrimp Fried Rice, which is amazing! This is obviously NOT traditional, so I am not calling this Chinese fried rice, of course. 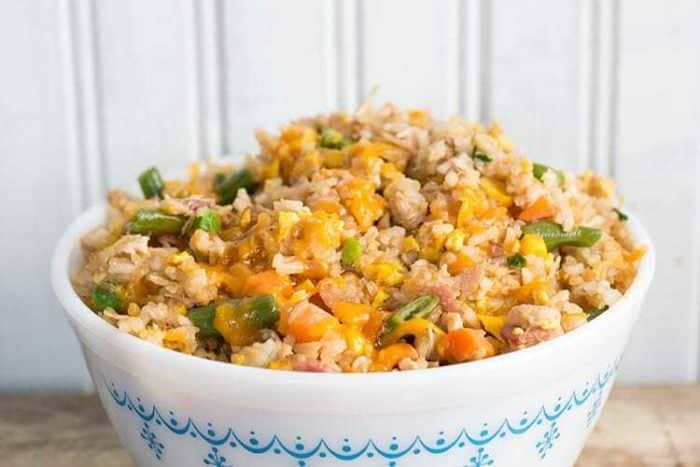 I DO think that bacon makes this fantastic, because the reason I am calling this an easy fried rice recipe, is because it’s SO flexible! If I don’t have chicken or pork or shrimp, I use bacon. If I do have chicken or something else, I still add the bacon for the flavour. The four flavours I mentioned first are a must have and you should have them in your fridge at all times. Please trust me on the oyster sauce, it adds an incredible depth of flavour that can’t be beat. I am literally making this tonight while writing up this post. I am letting the rice cool while Mike edits the video that you you see in this post and have fried up the bacon and the spices/sauces.I am then going to throw in some vegetables, egg and we are going to have dinner. Ugh. I am totally addicted to this. Trust me when I say that you NEED this easy fried rice recipe.You need it. I make this at least once every two weeks with whatever I have on hand. Tonight it was bacon as I had no leftovers. I would have thrown turkey or ham in if I had any leftover from Easter but I already used it in turkey soup. Easy fried rice means flexible. Fast. Delicious. I am SO excited to eat this in about 10 minutes! Happy cooking all! If you have any questions, leave them in the comments below! How to Make Easy Fried Rice : Recipe & Video! 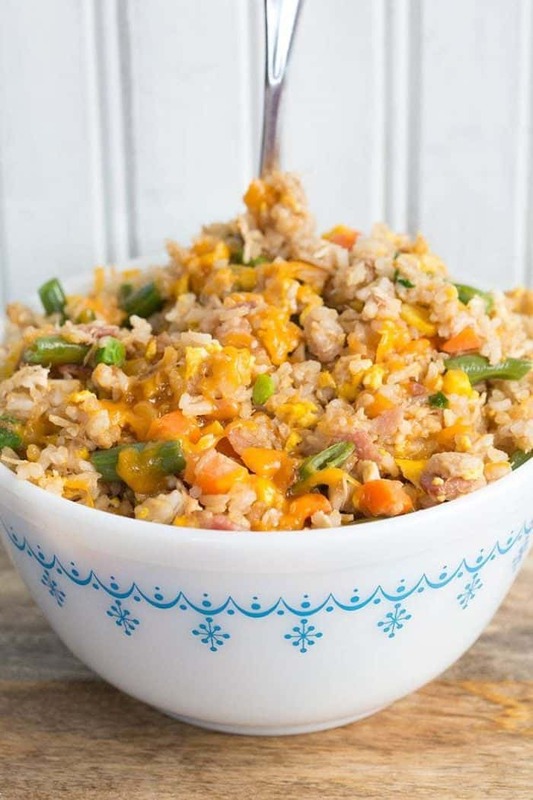 How to Make Easy Fried Rice~ This homemade fried rice is the BEST and the easiest fried rice recipe that you will ever make at home! 1-2 cups chopped meat of your choice chicken, ham, pork, whatever! In a large, over-sized skillet, fry the bacon on medium-high heat until it reaches desired doneness. We like ours tender-crisp in rice. Add in the sesame oil, soy sauce and oyster sauce. ( you can mix in more at the end, so start at 2 tbsp of each. I prefer 2 tbsp soy and 4 tbsp Oyster sauce, but feel free to mix it up to your liking!). Stir until all the sauces and bacon mix are combined. Add in the rice and fry until it crisps up how you like it. Stir in the meat and vegetables of your choice. If you need to cook the meat, make a well in the center and cook the meat on the bare pan until done, then mix in. It's better to pre-cook whatever meat you use, though! Fry the rice some more, taste and see if you want to add more soy or oyster. Mine always needs more oyster sauce, it gives it the most fabulous flavour ever! Serve up in bowls and let the family top with green onions and cheese. Trust me, the cheese takes this OVER THE TOP! You can use any leftovers that you can dream of when it comes to meat and vegetables. Don't skip the oyster sauce, it is literally what makes this fried rice the best ever! Older rice is SO much better than fresh! If you have to, throw the rice in your fridge to cool it completely and uncovered! The secret is to dry the rice out a bit, just like old rice! The more you fry the rice, the crispier it gets! I am all the time making Fried rice but yours are looking so juicy and tasty. I can not use Bacon but will try to amend mine as per your recipe with chicken. Thanks for great share with few ingredients. I always have frozen veggies on hand, this is brilliant! 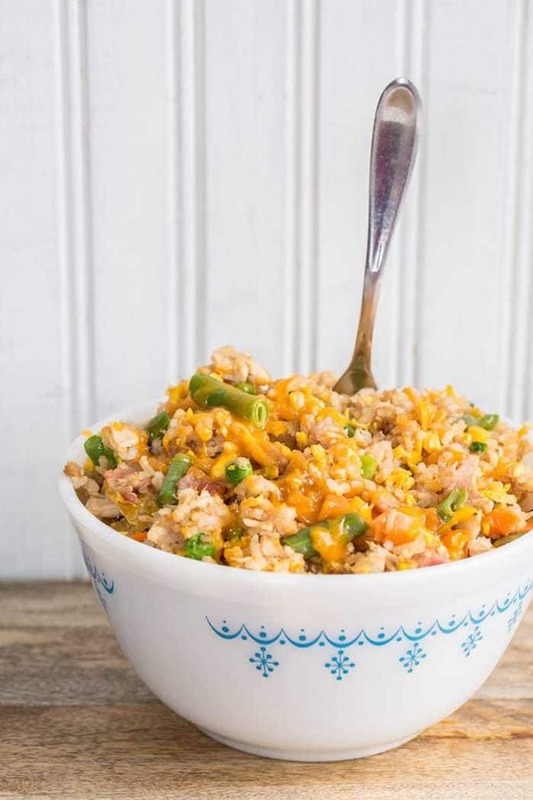 Fried rice should be a time saver and you throw whatever is on hand ( or in the freezer!) and not a big production of steaming fresh veggies! Getting oyster sauce tomorrow, will let you know!!! Thanks! And yes, if you have leftover veggies then great, but we usually DON’T! I always have an emergency bag of frozen veggies on hand! This is one of my favourite dinners ever!